White chocolate doesn't usually "count" as a Chocolate of the Day for me. It generally is too sweet for my taste, and any cocoa flavor or aroma is often lost in the processing. However, this No. 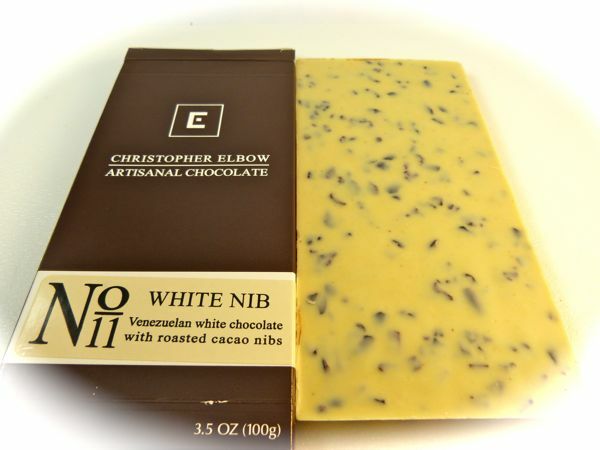 11 White Nib bar from Christopher Elbow Chocolates (St. Louis, MO) contained Venezuelan white chocolate and roasted cacao nibs -- and nibs contain cocoa solids (that give chocolate its deep brown color). The cacao nibs embedded in this bar added some crunchy texture and their stronger, slightly more acidic bite helped temper the sweet white creamy cocoa butter, sugar and milk powder that made up the white chocolate base. Today was Day #2 of Chocolate and Venezuela Theme Week.